Shlomo Yarimi of Yad Binyamin, a small town along Israel's coastal plain, runs an organization handing out free food and used furniture to those in need. Yarimi's gemach, or benefit society, was originally founded in Gush Katif prior to the disengagement in 2005. When forced from the area, Shlomo Yarimi's family, along with some 9,500 people, had to pick up and start their lives over in a new place. Even though he was no longer living in Gush Katif, Yarimi vowed to continue his humanitarian work and help Gush katif refugees as well as others in Israeli society. Yarimi works closely with the Karmey Chesed organization, who provides everything from clothing to food to loans to Israelis in need. Recently, Yarimi and Karmey Chesed have come to the aid of a family whose house burned down, poor newlyweds, and families who were unable to provide basic essentials for their children. "There have been many families who we have helped out," Yarimi said. "We have even had the privilege of helping families come back from being very destitute." "At one point, many of the families we worked with had no food to eat whatsoever. Some of these families were evacuees from Gush Katif who lost their entire livelihood when the government evicted and deported them. Others are farmers who fell ill and their families have no food to eat. We have taken them and helped them and managed to turn them around and get them on their feet. It's what we do." With the Purim holiday fast approaching, Yarimi and Karmey Chesed have teamed up to deliver light and joy to needy families across Israel. "Specifically for Purim, we deliver Mishlochei Manot (traditional Purim holiday baskets) to needy families and money to the poor which is also a commandment for the holiday," Yarimi told Breaking Israel News. This year, Yarimi is planning to hand out more than 100 packages for the holiday in his area. Karmey Chesed is also helping to sponsor holiday activities for local school children, including helping to pack and deliver the Mishlochei Manot. Children, whose family cannot afford costumes, will be able to pick out their very own thanks to Yarimi and Karmey Chesed. 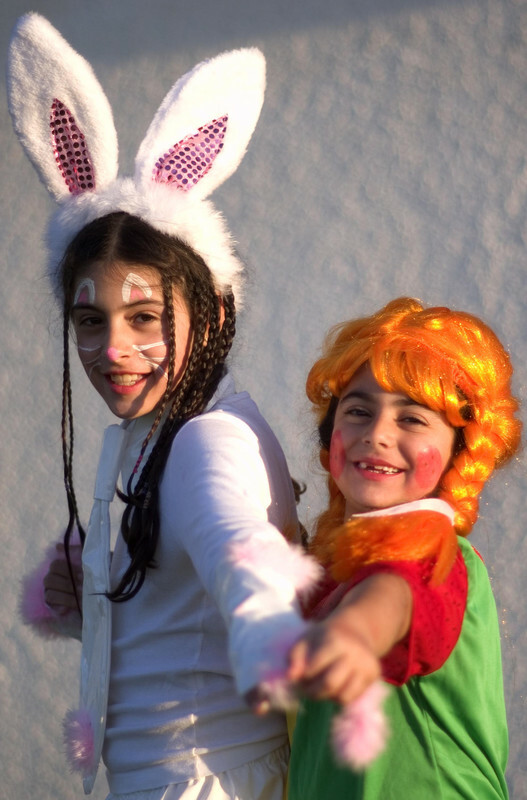 "It is customary to dress up in costume on the holiday of Purim, and many of the families cannot afford costumes for their children," Yarimi explained. "We help take this cost off of their minds, and help them to enjoy the holiday." Yarimi told Breaking Israel News that while there is never an end to charity work, it is some of the best and most fulfilling work to be in. "There are many clear miracles that happen when people are involved in helping others," said Yarimi. "I remember students in a local seminary called and said that 25 families had no vegetables for the Sabbath. I called a friend who had a farm and he said he happened to have a bunch of leftover vegetables this week that he hadn't yet sold and that I could come and take them. I drove over picked them up and headed to the town where the families needed them." "Just after leaving, I saw a soldier at a bus stop who was hitchhiking to get home for the Sabbath. I drove back to the entrance to pick him up, but in doing so I drove backwards over the security spikes that are in place at the entrance of the town. I rolled down my window and offered him a lift. He stood in shock at what I just done, going over the spikes, and told me to check my tires. I hadn't even known I went over them. I got out, checked my tires that should have all blown out due to the spikes, but not one was damaged." Miracles indeed do happen when it comes to helping others.